Easter time. 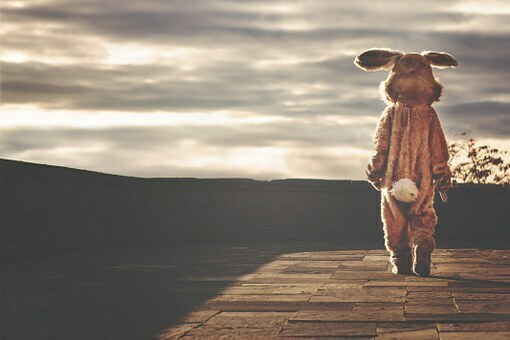 That time of the year when our children chase a mythological rabbit hoping to get chocolate eggs, when pubs complain they can't open whenever they want to, when shops have sales for electronic goods, and when our TV screens are filled with films and documentaries detailing the life and death of Jesus Christ. To be honest, there are a number of these Christian-themed films I enjoy. But two that stand out are Life Of Brian from the Monty Python boys and Jesus Christ Superstar from the pens and brains of Tim Rice and Andrew Lloyd Webber. As you've probably guessed, Jesus Christ Superstar is the one I'll be looking at here. It started life as a concept album. Really it did, and it featured Ian Gillan of Deep Purple! This lead to a series of live performances. The stage production was well-received, and so, in 1973, the film came out. This, unfortunately, was not received quite so well at the time. One critic even described Ted Neeley as "screaming Jesus" for some of his singing, and the complaints about an Afro-American playing Judas came from both ends of the political spectrum. I do not care. I enjoy the film. A lot. First, I should point out that I am not a religious person. Having said that, I was educated by Catholics, my father was heavily involved in the Anglican Church and relatives of my ex-wife who are Uniting Church of Australia members have recently been my mental saviours. I know a fair bit about the belief systems (have read the Bible, cover-to-cover, twice and other bits more than that) but I am not a believer. The reason I tell you all this is that, even to someone like me, this film, the music and everything about it still gets to me. I own it on DVD, and yet every year when it comes on TV I will watch it, loudly. I went to see the Australian version with John Farnham, John Stevens, Angry Anderson, Kate Ceberano and so many others, bought the CD, all that. I do enjoy it. It was filmed on location in Israel, and during the 'Overture' we see them setting up, dressing themselves, getting props off the bus, all that sort of thing, telling us that we are going to be seeing a movie, and not a documentary-style retelling of the life. Some critics complained about that, but I like it. It helps set the scene and allows that step into disbelief to come a little easier, because the film knows it's a film. I know that's a bit meta, but that's okay. The film, in my opinion, does not suffer for it. Some details. It was directed by Norman Jewison (who also directed my favourite movie of all time). 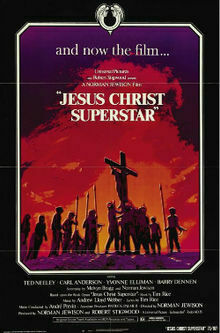 It stars Ted Neeley as Jesus, Carl Anderson as Judas, Yvonne Elliman as Mary Magdalene, and Barry Dennen as Pilate. It was done, as was the stage play, in rock opera style, which means the songs carry the story; there are no spoken pieces. Okay, back to the movie. The first song proper is 'Heaven On Their Minds' by Judas, which sets the mood of the character remarkably well. Anderson shows from the get-go that he is a fine singer. We go into setting the scene of the followers of Jesus, and Mary's place amongst them with 'What's The Buzz?' followed by Jesus and Judas arguing in 'Strange Thing Mystifying'. The songs merge seamlessly into one narrative. Then we are introduced to the Pharisees. The songs of the Pharisees are, to my mind, an unfortunate let-down in the film. They jar a little, especially the sibilant voice of one of them. Back to Jesus and his followers. 'Everything's Alright' is one of the highlights of the whole show, and the film is no exception. Between Jesus, Mary, Judas and the Apostles, it really sets the story moving nicely. Back to the Pharisees, and then Jesus rides into Jerusalem, with the lyrics foreshadowing what is going to happen. "Do you escape in the final reel?" always sat oddly as a lyric to me. And then we have 'Simon Zealotes". I enjoy the movie version of this song. I could do without the extreme close-up of Larry T. Marshall's mouth as he sings at the end, but the dancing, while a little of its time, is really well done and choreographed, with some nice (though out-dated nowadays in parts) camera work. This is something that annoys me about some (well, a lot of) modern musicals, be they on TV or in the films, even in stage productions – the dancers. Well, I should clarify. I do not see it in Bollywood musicals, and the few from the UK don't have the issue. But if it's from Australia or the USA, it's there. In this film, the dancers dance together, as they are supposed to, as an ensemble. It looks great. Well, too often in modern films, the dancers seem to put their "own spin" on what they are doing. So you have people in the background not quite doing the same as everyone else and it looks amateurish. A friend who was a dancer told me it's the way people make themselves stand out. Well, sorry, but you do stand out – as someone who cannot dance properly. I like the 'Simon Zealotes' song and dance number. And this leads to Neeley's first solo song – 'Poor Jerusalem'. I reckon it's actually quite good. The song itself is no great shakes, but his delivery of it lifts it. Now we meet Pilate. 'Pilate's Dream' is delivered really well by Dennen (who also appeared in The Shining! the weird places acting takes people…), and I find myself believing him as he's singing it. Then Jesus is in 'The Temple'. Not a great song on its own, but it really does set up the story well. The anachronisms have been pointed out by many critics here, but historical accuracy is not the point of this film. All of the things for sale by the vendors in this scene are things that anyone would see in one of those Church jumble sales. Yes, it makes a modern point, one that is still relevant. And then he meets the lepers and we see the conflict in the Jesus character. Again, modern allusions can still be made to this scene, people who pray for everything, expecting miracles. Next up the first of the two classic songs from the rock opera. Yvonne Elliman's version of 'I Don't Know How To Love Him' (she was on the original album as well) is the best I have heard, and this song has been recorded by very many people over the years. There is something about her voice that just carries this magnificently. Sure, others have been good as well, don't get me wrong, but hers is the best. And the next story song comes along – 'Damned For All Time/Blood Money' as Judas betrays Jesus and receives his thirty pieces of silver. Again, not a favourite song, but necessary to get things going. 'The Last Supper' features the confrontation between Judas and Jesus. I like the freeze shot done to look like da Vinci's painting. Nice touch. Again, a story song, but carried into something above just that by Anderson and Neeley. And we go into 'Gethsemane', which is what the unkind quite about Neeley from earlier alludes to. I disagree. You feel Jesus' conflict, his internal struggle before going to his fate. Another of my favourite songs from the film, punctuated by famous images of Christ on the cross from various paintings through the centuries. I will say, though, that some versions of the rock opera have let this song down. It must be a difficult one to get right. 'The Arrest' is another story-line song (and I like the way he is questioned by the crowd, like grubby journalists… which is also still relevant today), leading to 'Peter's Denial'. Not too bad, and they certainly don't overstay their welcome. 'Pilate And Christ' follows, and while it is another story-pushing song, again the way Neeley and Dennen carry it, make it more than just that. And this leads to the film's comedy song – 'King Herod's Song'. It's meant to be silly in a way to make Herod seem like a nothing, and Joshua Mostel makes a good fist of it, but I do prefer Angry Anderson's version. Now we come to my favourite song in the film, and the rock opera itself. 'Could We Start Again Please?' by Yvonne Elliman and Philip Toubus (as Peter) is a beautiful song, impassioned and yet sad at the same time. And this is the best version of it I have heard. When Belinda and I separated way back when, I actually sent her a cassette with this song on it. It didn't work, but I tried. Then we get 'Judas' Death'. Anderson delivers incredibly, and you actually feel for him. And then the mainly instrumental and visual ending hits; it sets a stark image, when Judas hangs himself, and the use of staccato guitar is ideal. It is very well done, seldom done better, and without special effects. And now we hit the crux of the film. 'The Trial Before Pilate (including the 39 Lashes)' is intense. The singing brings out the sheer desperation of both men until, finally, Jesus is condemned to die, leading to the other classic song from this rock opera, and the most famous song it gave to the world – 'Superstar'. Judas comes down from heaven to talk to Christ, to ask what he thinks he is doing. Anderson's singing is great, and he adds emotion rarely heard in the song. But… This is the most dated thing in the entire film. The disco neon, the swaying crosses, the afro-haired backing singers, the slight disco beat to the music. It jars today. Where the rest of the film's music and set pieces stand up fine now, 40-plus years later. This… not so much. The biggest song in the film and it has not aged well at all. Another two instrumentals follow – 'The Crucifixion' (okay, there's some words, but not many), ending with the crucifixion. And there you have it. Is it a perfect film? No. Not at all. Is it a good film? Yes. I have seen it so often I know all the words to all the songs, and yet I will watch it again and again. For the record, I also own the CD set (which is where I got the song titles and singers from) and have it on VHS as well as DVD. So, to summarise, I do enjoy this. And I recommend it. I've not seen this film and probably won't ever watch it but I am keenly awaiting your review of Life of Brian (please).